Holick, M.F., Semmler, E.J., Schnoes, H.K., Deluca, H.F., 1α-Hydroxy Derivative of Vitamin D3: A Highly Potent Analog of 1α,25-Dihydroxyvitamin D3. Science, 1973, 180(4082):190-191.; Hayashi, Y., Fujita, T., Inoue, T., Decrease of vertebral fracture in osteoporotics by administration of 1α-hydroxy-vitamin D3. Journal of Bone and Mineral Metabolism, 1992, 10(2):50-54. 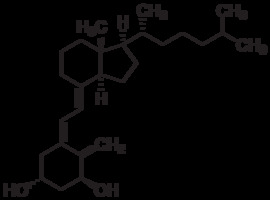 Description: Synthetic vitamin D3 analog. Inhibits bone resorption and stimulates intestinal calium absorption and bone mineral mobilization.